On Mother’s Day we watched the movie about the life of Mother Theresa. Although she never had children of her own she was a mother to thousands. When faced with the impossible she would simply state, in faith, “If God wills it, this will happen”. Not to say that she didn’t have any hardships – she ran into many road blocks along the way. But, she never gave up on humanity – no matter how lowly the person may have seemed to society. Living in Liberia, we find ourselves on a daily basis being thrown into situations that have us crying out, “Lord, what are we supposed to do?” Our home church, Foothill Covenant, took an offering to assist with the many medical needs we have coming to our door. Those funds have now been exhausted – but the patients keep coming. And I, Karen, just doesn’t know how to say “no” – especially to a mother holding a sick child. I find myself thinking how can we afford yet another patient – but I have to believe that they have been brought to us by God and He will help to take care of the needs – both now and in the future. Kreig and the kids are very supportive and allow me to spend the funds when I feel it is necessary. My head spins when I think of just this week alone. I’ll try to give you a quick view of the people we met and helped this week. At 9:00PM Fatamata and Ramatu called saying that they had arrived safely from Sierra Leone. We had waited all day to hear of their arrival. Ramatu, a 5 month old baby girl, has hydrocephalus and needs brain surgery to place a shunt – relieving the pressure to her brain. She had been referred by the Mercy Ships clinic in Sierra Leone and we had agreed to assist them in getting to the hospital and the details surrounding surgery. Kreig picked them up and brought them home while Christina and I quickly preparing the guest room for them. 0730 – Musu arrives with Tennyson. He is 11 years old and lost his father during the war and his mother abandoned him. Musu, his Aunt, has taken her nephew in to live with her. He has 2 congenital hernias that need repair. He will go to Firestone Medical Center for surgery. 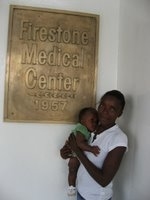 1030 – Karen drives to Firestone Hospital where Dr. Sherman will admit Tennyson and Ramatu for surgery. He will also examine Agatha, a 15 year old, who is 6 months pregnant with her first child. She planned on having a home delivery with a “midwife” – most of the time these midwives have no formal training. Karen insisted that she go to a proper hospital or we wouldn’t assist with the delivery expenses. 1530 – Patients examined and everyone settled into their hospital beds. 1800 – Karen arrives back home. After arriving home from Womens' Bible Study, Karen was greeted by James and his Grandma whom we had helped with medical care. She had come to say thank you and to tell us of a baby that was born near them that had, “two sacks protruding from the base of its neck”. Karen decided to walk with them home to “Peace Island” – a squatter community where thousands live in small, shanty-style houses made of mud and stick and then plastered with cement (if they are fortunate). During rainy season this area is only accessible by canoe. We arrived to find the baby being watched by other family – the mother had left 6 hours earlier to go notify the father of the baby about its condition. The baby had received no fluid since the mother left. It was a very hot day and Karen was concerned that this 48 hours old baby wouldn’t survive if we waited for the mother to return. The “sister” agreed to take the baby to Benson Hospital – so Kreig left work to come and “taxi” us there. They admitted the baby and will keep her until we have a plan. A neurosurgeon from the USA arrives next Monday, so Karen emailed him pictures and information about the baby. 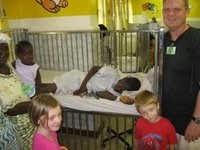 We will wait and see if surgery will be an option for this child. A neighbor comes to the gate saying he has had fever for 2 weeks. We send him to the ELWA Hospital where they test him and give him treatment for Typhoid Fever. The doctors at Firestone decided to wait on placing the shunt on Ramatu. They want the neurosurgeon to evaluate her first to see if a newer procedure called Ventriculoscopy is an option. Karen arranged housing for them at the ELWA Guesthouse until the surgery can be completed. After getting them settled in we drive home for dinner. On our drive home we are shocked to see that the “Government Community Clean Up Team” had come through and knocked down 30 to 50 shanty style houses. With very short notice their structures were knocked to the ground by a large bulldozer and in some cases by strong men with sledge hammers tearing the walls down with their hands. Our hearts ached as we realized how devastating this would be for so many. The rainy season is almost here – where will these poor people live? While getting ready for bed, Moses Uncle called - he explained that his 20 year old daughter had just been admitted to JFK Hospital – she was 9 months pregnant and needed surgery. Thankfully Karen had the phone number for Dr. Jallah, the head OB/GYN at JFK. Dr. Jallah explained that the patient arrived at the hospital with pre-eclampsia and had been having seizures for the past 2 hours. An emergency c-section was needed. Karen promised to come immediately with the funds to pay for the surgery. Dr. Jallah said $65.00 would need to be deposited for the initial payment and agreed to take her to surgery before the money arrived (not a normal occurrence). James, the nightguard at our house, and Karen left for the hospital and arrived to pay and sit with the family from 11:00PM until after midnight. Thankfully both mother and baby survived – although the baby inhaled a lot of muconeum and the doctor says the next 48 hours will tell if she’ll make it or not. The family had no idea how life threatening the situation had been until it was all over. We thank God that we were here and able to respond quickly. Unfortunately this is not an isolated case – without payment there is no treatment. It is a sad reality here in Liberia. As Mother Theresa says, “What I do is just a drop in the ocean. But, if I didn’t do it then that drop would be missing”. Thank you to all who have given so generously and faithfully to our ministry. It was 12 years ago, May 1997, that we started our ministry with Mercy Ships. At that time we had no idea the journey that God would take us on and all that He had in store for us – but we thank God for it all – even the challenges. 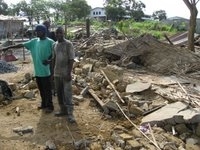 Thank you for continuing to pray for us and the people of Liberia. The needs are overwhelming . . . but we’re trying to make a difference one person at a time.